Home Articles UV-C LED Systems: Land of Opportunity or Wild West? 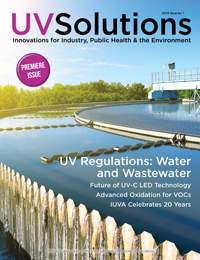 Since their first commercial availability approximately 15 years ago, UV-C LEDs have been heralded as an opportunity for the development of novel water treatment systems. Particularly over the past five years, as UV-C LEDs have increased in power and reduced in cost, they have offered, at the very least, something new to study, critique and obsess over. Does this new technology offer a bright new future of open opportunities and easy solutions or a Wild West with little regulation and understanding of the limitations? This question looks at emerging UV-C LED technology through two distinct lenses. One, which is optimistic, where small semiconductor devices are easily integrated and able to tackle problems never before possible with conventional gas discharge lamps. Or another, more dangerous, view, in which lack of design rigor and validation are coupled with over-reaching marketing claims. Why is this even a question? 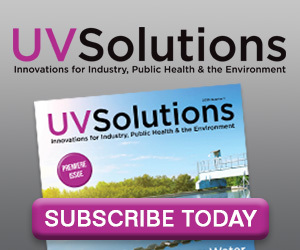 What is wrong with applying existing UV technology regulations to UV-C LED technology? This is not a unique case. As a rule, applying existing regulations to new technologies restricts the innovative nature of the new technology, preventing it from fulfilling its potential. Consider the requirement for an exhaust pipe to exit the rear of an electric powered car. The opposite case also applies where there is potential for exploitative approaches to be taken. Consider an electric car claiming to be emission-free, while ignoring the electric power generation needs for re-charging. For example, applying regulations intended for monochromatic, 254 nm light sources to UV-C LEDs, without wavelength correction factors is flawed. As is ignoring UV-C LED aging characteristics in system sizing. Blindly applying inappropriate regulations is problematic. So, also, is ignoring regulations entirely. By doing so the credibility of this new technology is undermined, and implementation by serious professionals is limited. UV-C LED devices themselves get a lot of attention for their specific characteristics – form factor, emission spectra, power output, efficiency, etc. However, they are merely one component in a complete UV water disinfection product – batteries in an electric car, for example. The complete UV system must be considered. Reactor body design, thermal management strategies, monitoring capabilities and control issues are all just as important as the LED device. Ultimately it is the UV system that must deliver the required log reduction, and while wavelength and power are important, so are fluid dynamics and intensity distribution. microbial loading/recontamination resulting from biofilm formation. Due to the complex nature of the overall product design it is not obvious which aspects of the architecture should be optimized, which should be accounted for with safety factors and which may be safely ignored. 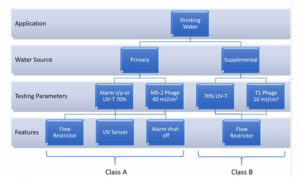 Any one of above could impact the performance of a system incorporating UV-C LEDs such that, having passed a microbiological study at the UV disinfection reactor level, the final integrated product would not provide reliable disinfection. 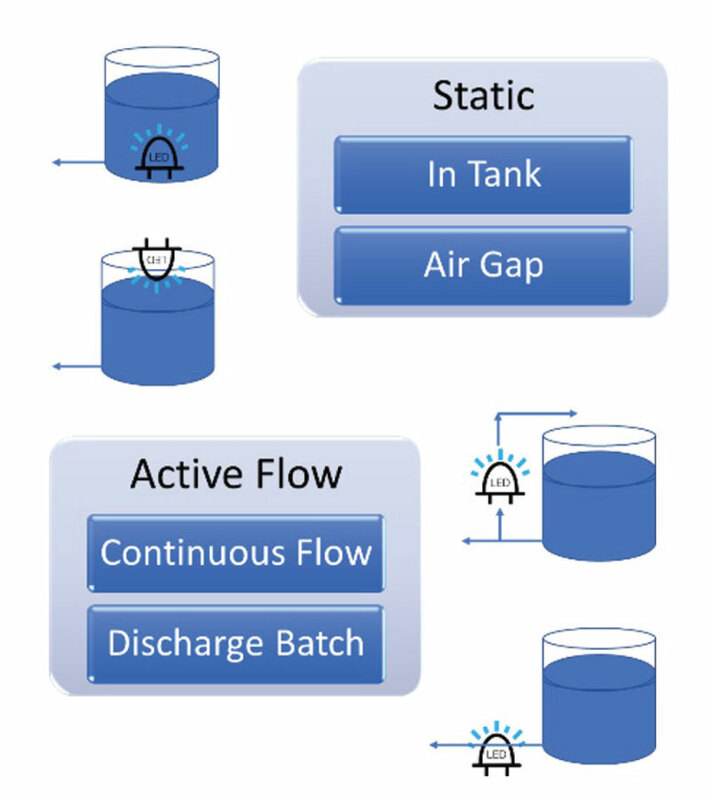 Another example can be seen with a “Static, In Tank” installation, depicted in the Intensity Distribution model in Figure 2. The specific placement of a single very low output UV-C LED within a tank shows areas of very low, or essentially zero, UV intensity. Germicidal effectiveness in such an installation will depend in large part on how this system is used: Is there mixing? How often is the tank filled? Is the tank ever drained? Therefore, thorough microbiological studies at both the final product and UV reactor level are advised, in addition to testing of the UV-C LED device itself. NSF 55 is a good example of how this requirement is employed. 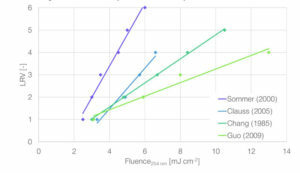 Commercially available mercury-vapor UV systems available today are marketed based on microbiologically verified sizing and on modeling-verified sizing. 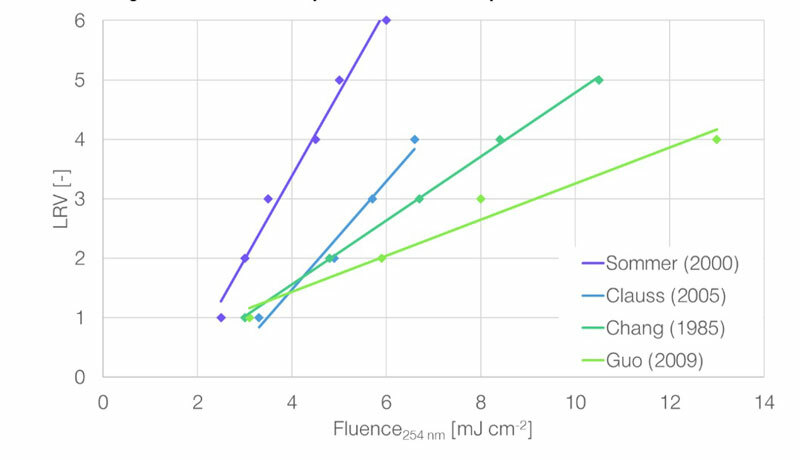 For the new generation of UV-C LED low flow systems, the trend seems to be heavily weighted toward microbiologically verified sizing. However, it is not uncommon to see products challenged using E. coli and the performance reported as a percentage inactivation. This is predominately a drive from the Asian market, where national water quality standards cite limits to coliform contamination, though these articles often do not consider UV directly. 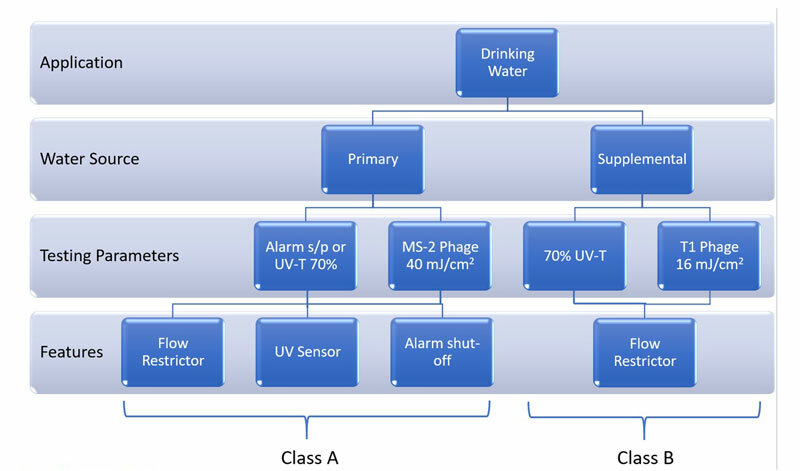 The use of E. coli is particularly troubling for UV systems chiefly due to its relative ease of inactivation – giving poor transferability to other, more resistant, microbial species – and secondly due to the significant variability in UV sensitivity between E. coli strains. See Figure 3. This test method typically considers the inactivation of E. coli by a clean, new module in a short duration test; this approach often lacks even simple considerations, such as accounting for end of life lamp output. Further, the tests invariably consider very-high UV-T water samples, a nuance of device performance that is often not transcribed to the numerous end-user applications. ANSI/NSF 55 has long been a benchmark certification standard for low-flow UV systems. The standard is divided into two parts, Class A and Class B, determined by the water source and with the microbiological testing parameters and product features differing accordingly. See Figure 4. Following the well-established ANSI-based Consensus Process, NSF is actively managing a joint committee to update the Class B standard. According to NSF, it is close to the balloting phase of the process, prior to formal adoption likely in late 2019 or early 2020. The key issues being addressed are the ability to use light sources that emit wavelengths other than 254 nm (i.e. UV-C LEDs), a move away from minimum dose to log reduction and changes in test organism/UV absorptive chemical type. This updated standard will be welcome by manufacturers of UV-C LED-based water treatment products, as the market pull has been strong for such certification. However, the demand for Class A-level performance, even for Class B-level water sources, is a clear trend. It’s unclear when the NSF joint committee will start work on updating the Class A portion of the standard, or if this will indeed even address the expressed market demand. Within any production process some variability of quality is expected, and for UV-C LEDs it is no different. 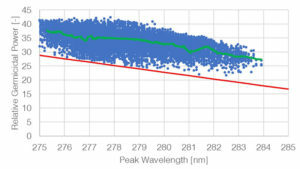 However, in this case the variability affects both the optical output power and the peak wavelength – two key characteristics that influence disinfection performance. When marketing claims are made on the performance of a small number of devices, or even a single device, this inherent variability in performance is not communicated. Figure 5 shows variation in relative germicidal power and wavelength of 13,000 UV-C LEDs from a single manufacturer. It is an exciting time to see the development and new application of LED technology in water treatment processes. Tens of thousands of UV-C LED-based products have been produced over the past year, and volumes are increasing exponentially. However, as the list of these products grows, the question of safe implementation needs to be addressed. The responsibility for design, production and operational quality largely sits with the manufacturer, in the absence of suitable regulations or industry guidelines. At present, manufacturers are taken on their word that their products meet their marketing claims. 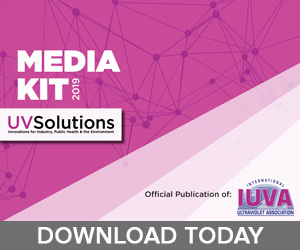 System integrators (OEMs) should – and in the case of responsible parties, do – require manufacturers to verify their claims in scalable production. However, in the present vacuum of regulation, a pyramid of trust is built from the LED manufacturer through to the UV module manufacturer, the OEM and finally to the end user – with no rigorous framework for oversight or accountability. Spurious product claims risk the health of unassuming end users across the world, with the potential to degrade trust in UV systems and set an unnecessary barrier to the widespread implementation of a technology with so much promise. Definition of minimum standards is clearly needed, and it must be ensured the next steps taken are in the right direction. 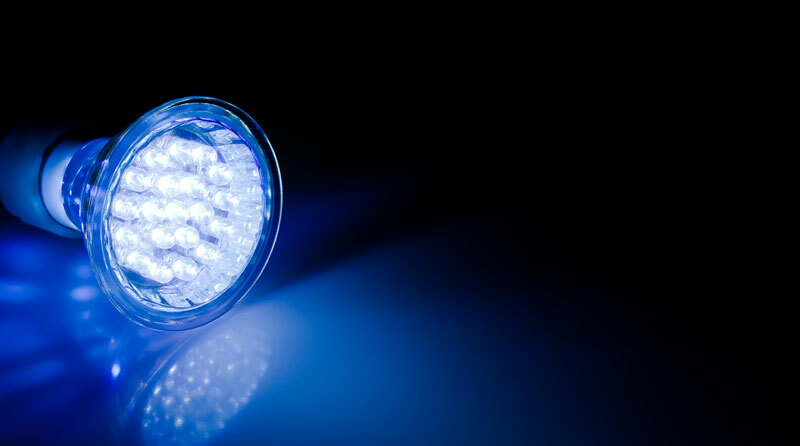 It is not appropriate to consider a cookie-cutter approach or simple application of conventional UV technology standards and “making it fit” for LEDs. At best, it may end with a system that is difficult to navigate. At worst, there is the potential for exploitation or stifling of innovation. What is most critical at this stage is that these developments are not ignored and positive steps are taken toward building a rigorous, future-proofed industry environment.